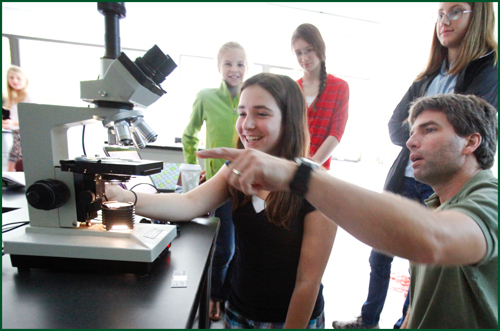 The academic program at Vermont Commons School is a dynamic educational experience. It incorporates the Guiding Principles and genuine life experiences. The basic skill areas provide the base for inquiry and construction of knowledge, while the field-based programs provide a laboratory for students to test these skills and interact with their community. Our 2015-16 Course Catalog describes our unique and integrated curriculum. The central purpose of all academic activities is to provide students with the skills, knowledge, and experience to understand the interconnection of their local and global ecosystems and communities, to recognize their own roles in these systems, and to formulate a personal and spiritual investment in their natural and social worlds. The study of “place” affords the opportunity to discover and explore how one’s environment, community, and actions are interconnected with the rest of the world. In order to accomplish this goal, each discipline provides students with the opportunity to develop the skills to describe, understand, analyze, communicate, and interact within their local and global communities. The classroom study in Science, Art, English, Mathematics, Social Science, and World Languages allows students to form the base for observation, inquiry, analysis, and communication. The field-based programs provide the opportunity to integrate the academic skills with real-world experience. Research & Service is a field-based program that integrates research, analysis, and communication skills with the goal of developing service projects that make a lasting, positive impact on the community or environment. The Research & Service Program enables students to learn about their community by experiencing their ability to have a positive impact on the lives of community members. We invite you to read our School Profile.